To soothe all the bad news about restaurants dropping like flies, I offer some better and meatier news on the DC dining scene. First, burgers. Michael Landrum caused a virtual (and literal) stampede on donrockwell.com today when he announced the opening of Ray's Hell-Burger, aka Ray's Butcher Burgers. The burger shop is located in the same strip mall as Ray's The Steaks at 1713 Wilson Blvd. Speaking of burgers, Capitol Hill's Good Stuff Eatery will officially open July 7. Snide commenters across the internets are already hating on the place and on co-owner and Top Chef contestant Spike Mendelsohn, but for heaven's sake, let the place open already. The menu looks damn good. And the proof is in the pudding ... or the toasted marshmallow shake, in this case. On to noodles ... the word on the street is that Wagamama, which previously announced plans to come to DC, will move into the recently shuttered Olsson's bookstore in Penn Quarter at 418 Seventh St. NW. Up Seventh Street, the first US location of Nando's Peri-Peri should open in July. The international chain specializes in flame-grilled chicken spiced with the peri peri chile pepper. The DC outpost is located at 819 Seventh St. NW. Meanwhile, check out the new additions to Metrocurean's coming soon list, including Bryan Voltaggio's Volt and Art Smith's Art and Soul. Ray's Hell-Burger was fantastic. There were some issues with the wait, but all of that will be solved with time. He's got a great product (I know, surprise surprise) and I can't wait to keep going back. 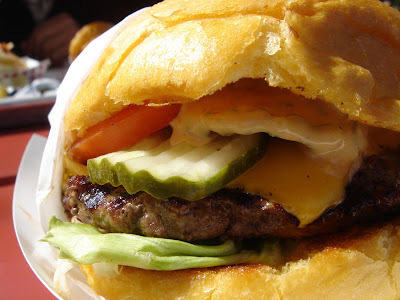 Expect to see his burgers on your five bites list often. Oh, and something that the North Carolinian would appreciate: they have cheerwine. Cheerwine?! Woohoo! Thanks for the report, Anthony. I read something about a place called Cafe Salsa opeing on 14th near Cork. My two cents. Went to the friends and family soft service at Good Stuff tonight, and the burgers live up to the hype. They were turning out perfectly medium-rare patties despite this being their first night of service. The banh mi style Blazin' Barn is definitely worth a visit. No toasted marshmallow shakes yet, but the strawberry was tasty. Did Ray's Hell-Burger for dinner tonight (I'm getting ready to admit I have a burger problem) and it was practically a religious experience. We waited less than 10 minutes for our grilled-to-order burgers and they were delicious. Landrum was there cubing the meat while we ordered and everything seemed to be moving like clockwork already. Definitely worth the visit - How can you beat $6.95 for a 10 ounce burger with corn on the cob and a slice of watermelon? Thanks for the reports, capitalspice. I love the addition of the watermelon and corn with the burger. Generous and perfect for summer. Great experience at Ray's. A friend found her burger too rare, and upon discovering her barely-half-eaten burger a staff member gently told her she wished she had spoken up (they could have thrown it back on) and promptly gave her a free (waffle) cone. I had the blackened burger, it was fabulous, there was no wait, and we had a few pitchers of root beer (on tap!). And to anyone who complains about the lack of fries--you do NOT need fries when you have a 10 oz burger, which is more than double the suggested meat serving for one person at a meal. Went to Good Stuff last night for a bacon cheeseburger and fries, no shake. The thyme-rosemary-pepper fries were good, but they cut the fries really short so you end up with a cup of half good fries and half tiny hard burnt bits. I would order them again. The burger was not good. Maybe it's just that they are overwhelmed (it was pretty busy for a weeknight), but they are PRE-COOKING their burgers, then reheating. Mine was well-done, pretty dry, and full of gristle. The bacon was undercooked so it was chewy and hard to bite through. The bun and other condiments were good. Thanks for the early reports! And to jno: I heard they presented at the ANC meeting the other night. The same spot as in Alexandria, I think?